It's human nature to cook too much of a good thing when found in abundance. That's what happens quite often with ' Honey Mushrooms ' because often when these are found you find them by a bag fulls ( and I mean BIG bags - paper type grocery bag ). And, to make things even easier, when picking these in cooler weather you will not have much waste due to bug infestation so your bag will fill even easier/faster. When you get them home all pristine and beautiful looking you will put too many in the skillet and ruin the sauté because honey mushrooms have a tendency to be mucilaginous, that is, they have a tendency to produce a thickish, slimey liquid. That turns some people off. It also causes some people to experience upset stomachs. However, for those that know about these mushrooms the problem is quickly eliminated by briefly cooking in a bit of water and then discarding the water before sautéing. These are great mushrooms for people that don't get upset stomachs from them or are not allergic. Like most foods not everyone can tolerate everything. 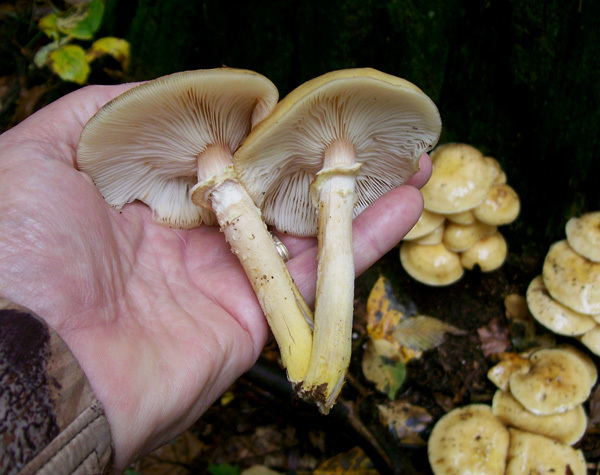 Honey mushrooms are reminiscent of Shitakes in appearance and texture. They hold their flavor well, they dry real good and canning these is a snap. Honey mushrooms ( the name is because the cap color is usually some hue similar to honey ) are wood growing mushrooms, usually on stumps and old trunks. 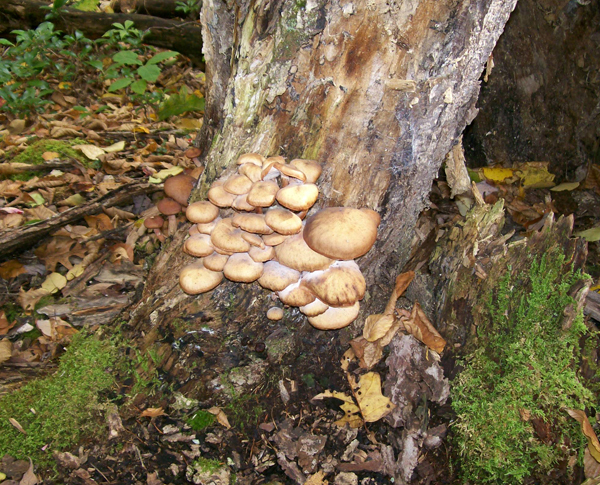 You will however find them growing away from stumps and trunks on occasion and you might think they are not honey mushrooms ( which is a distinct possibility ) but it is also likely that those are still honey's but growing on tree roots or wood just under the soil, like buried limbs, twigs or branches. 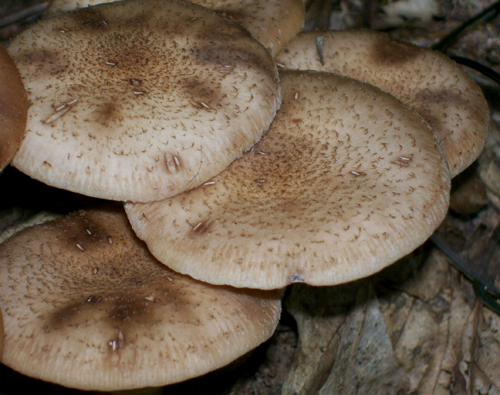 Honey mushrooms can be very deceiving as far as their appearance is concerned. There are dozens of variations in the brown hue, from a light chamois to a definite brown. Some will be generously covered with fibrils ( fine little hairs ) on the cap. Some will be very light in color and the fibrils all but gone or flattened so much as to be hard to see. In wet weather it sometimes happens that some of the fibrils get washed off. 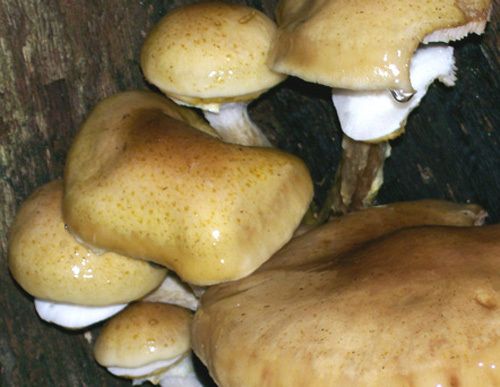 Because of the many different looking hues, appearances and tree hosts some guides say that honey mushrooms are a 'complex' of at least 14 different types. Some say there are two main types, an early variety before the leaves turn and a later variety as the leaves start to fall. 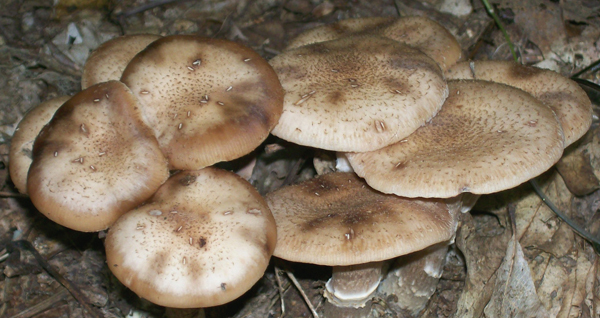 Nevertheless, there are so many similarities that it should not be overly difficult to determine that it is an Armillaria mellea variety that is being viewed. Spore color is one of the most important features in mushroom identification. In honey mushrooms it is often possible to see the spore color because it's cespitose growth nature usually results in overhanging mushroom caps depositing spores on lower caps. In the photo below, a closer view of the first photo above, you can see the spores ( being either very light yellow or whitish ) deposited on the lower cap's surface. Gills are attached to the stalk, sometimes slightly decurrent ( descending the stalk ). Gill color is whitish with a hint of tan ( light cream ) getting darker with age. Also there will often be areas in the gills with dark spots. In the photo below two fine examples display their gill color, the long fibrous nature of the stalk and the ring around the stalk. The stalk will be durable. Indeed, it is recommended that the stalk not be eaten due to the toughness. Best to cut it off close to the cap and discard it. In the photo below you can see the cottony white veil remnants drooping down from the cap's margin. Having a veil is another important feature. The dropped veil leaves behind the superior ring on the stalk. The ring is delicate therefore it sometimes is not there. Careful observation however sometimes finds it laying at the bottom of the stalk, like a crumpled up skirt. Here in southwest Pennsylvania you will find varieties of these honey mushrooms from late August to late October, longer if the weather remains wet and mild. I particularly like picking them in mid September, if the weather has been cooperating. 1. First off, if they are not growing on wood I will not bother with them. the stalk off or you will mutilate the mushroom trying to neatly break off the stalk. the ones I am holding in the photo above. They will have the best quality. determined. Often it can. Sometimes not. If not I leave them. It's the same thing I do with 'chicken of the woods' mushrooms ( Laetiporus sulphureus ). 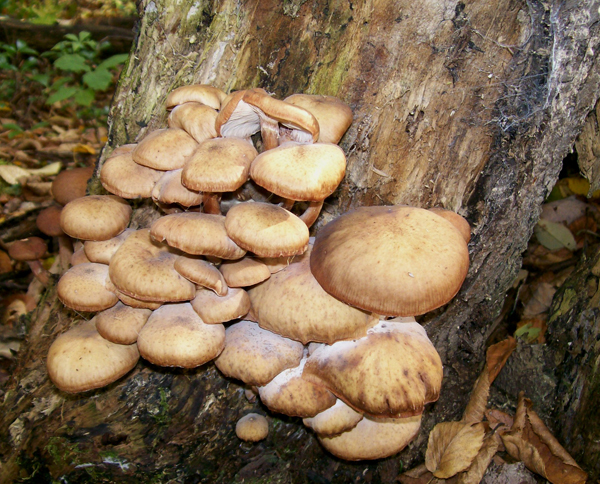 Armillaria mellea - A/K/A - Honey Mushrooms. DATE - Late August through October. FOUND - 'Laurel Hill State Park, Forbes State Forest near Kregar, Pa., Stahlstown, Pa. and Linn Run State park. Growing in mixed hardwoods with mostly beech and oak. Wet weather conditions in the Fall usually result in these being found in abundance. 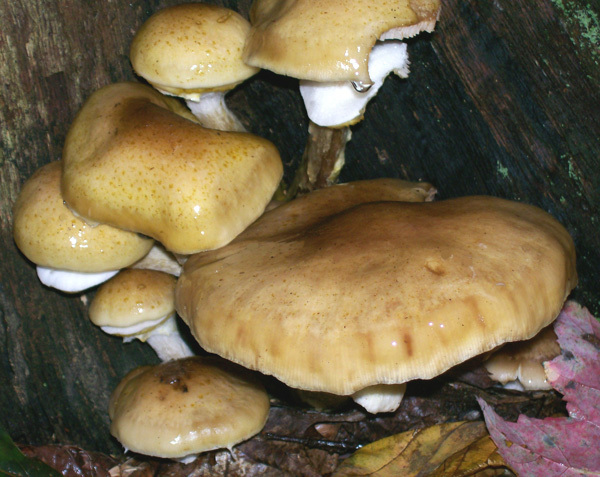 The Fall of 2010 was not one of the better years for honey mushrooms.